Holding onto poinsettias after the holidays is good for the pocketbook but hard on the ego when you can’t get them to color up the next year. To get you through the grief experts at Oregon State University Extension Service give the gift of good advice. Now’s the time to start coaxing poinsettias back into color and bloom for December. Sensitive to day length, the poinsettia needs a certain minimum amount of darkness each 24-hour period to stimulate blooming in the winter. With the shorter fall and winter days in Oregon, the plant has a natural tendency to bloom in spring, when there are about equal amounts of dark and light. If the plants are exposed to lights inside the home, they won’t receive enough darkness to start blooming and could stay green through winter. To make a poinsettia bloom in early winter, indoor gardeners simply need to adjust the amount of light and darkness to “fool” the plant. This can take quite a while. People often forget to cover the plant one or two nights. Interrupting the darkness by even a few minutes may cause failure of the coloring. Bring the plant to ordinary light after the bracts show color. You may have better luck if the bracts are almost fully expanded before bringing the plant out. 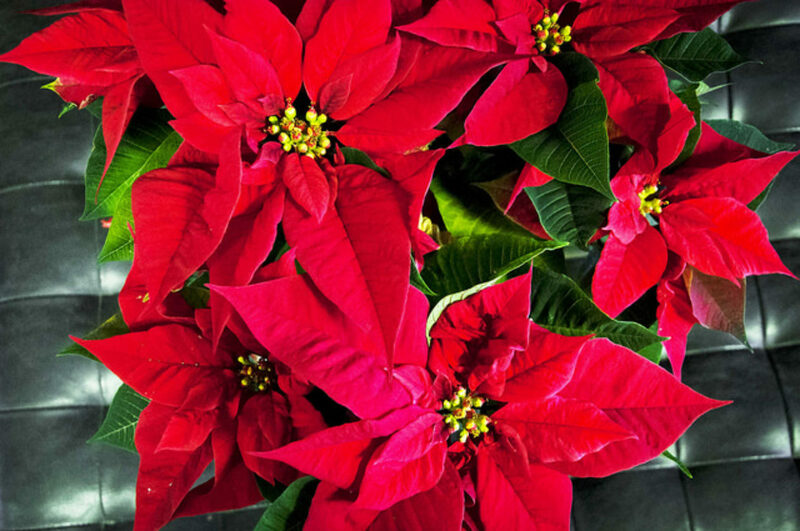 Once the plant has large, colored bracts, the artificial light inside a house will not inhibit a poinsettia’s blooms. Mid- to late October – Begin giving poinsettias long nights (darkness from 5 p.m. to 8 a.m.). Cover with a cardboard box or black plastic bag or place it in a dark closet. Mid-November – Color should be showing in the bracts. Early December – Bract color should be almost complete. Plant can be brought out into ordinary light. December until February – During this “forced” bloom, keep the temperature between 60 and 70 degrees. Poinsettias are particularly susceptible to cold. Let the plant receive as much sunlight as possible during the day. Water regularly and thoroughly. Throughout winter, fertilize once a week with a water-soluble fertilizer at half strength or less. Over-fertilization will cause the leaves to drop. Keep plant away from hot or cold drafts. Leaves may wilt if the plant is too dry, too wet or exposed to a draft. Never allow a plant to stand in water. Yellowing of foliage may indicate insufficient light, over-watering or lack of nitrogen. Generally, a slight correction of the environment will correct any of these symptoms. After blooming, the plant’s bracts and leaves will begin to fall naturally. Discontinue fertilizing and reduce watering. Cut the plant back to 6 inches. Water only enough to prevent the stem from shriveling. When summer rolls around, repot the poinsettia if necessary. When you see new growth, start watering regularly and feed every two weeks with a balanced (the three numbers on the label are the same) fertilizer. As they grow, pinch back stems to encourage branching. Grow it outdoors or as a houseplant. If grown outdoors, be sure to check for insect pests and treat if needed. Next autumn, start the cycle again.